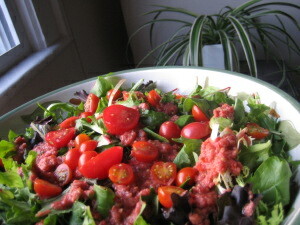 Looking for a raw tomato dressing recipe? 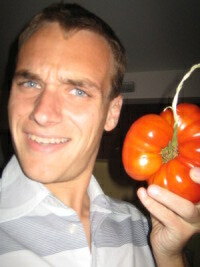 Like my tomato soup recipe, this one came out of a meander through my garden several years ago. I was thinking that there were no good options for low fat raw salad dressings. For a dressing lover, that's quite the depressing thought. I wandered through my garden and decided that I would try to come up with something better than the bland recipes that I'd seen online. I grabbed tomatoes, celery, basil and parsley. I threw them in my blender and found that I had created something quite delicious. There are tons of variations you can create out of this tomato dressing recipe. At its most basic, it's just tomatoes and celery, which is nice in its own right. I prefer to add some basil and parsley leaves in, which really kicks up the flavor. If you want some overt fat in your diet, add in a bit of avocado for a heavier dressing. By adjusting the amount of celery you put in, you can have this be anything between a salsa-like dressing and a more normal liquid dressing. The one caveat that I'll offer is to start off with a small amount of herbs. Several freshly-picked leaves may be enough to overwhelm the dressing. Go back and add more if you wanted a stronger flavor. Blend tomatoes, herbs, and avocado (if desired) until liquid. Add in celery until desired consistency is reached. Less celery will make it more liquid, more will make it salsa-like. When dealing with dressings, having a good blender makes a difference. If you're looking for a good one, I recommend a Vita Mix for my tomato dressing recipe.